Paw Print Genetics - I perform genetic testing for CNM on my Labradors, but what is CNM? CNM is a hereditary muscle disease of dogs caused by a genetic mutation in the PTPLA gene. This disease was first described in dogs (Labrador retriever) in the medical literature by Dr. John Kramer, DVM and others in 1976. The signs associated with CNM vary in severity, but include generalized muscle weakness, difficulty eating, abnormal gait, exercise intolerance, increased collapse when exposed to cold, and decreased reflexes. As the condition progresses, generalized muscle atrophy is seen and is attributable to the microscopic changes present in the muscles as described below. Affected dogs will normally begin showing signs of the disease in the first 6 months of life. The disease tends to progress in severity until about one year of age when the progression will typically stabilize. However, affected dogs will continue to have issues related to the disease throughout their life. Originally called hereditary myopathy of the Labrador retriever (HMLR), this disease is inherited in a recessive fashion, meaning that affected dogs need to inherit two copies of the causal mutation (one from each parent) in order to develop the condition. 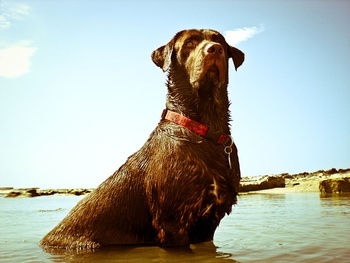 In a study by Marie Maurer and others in 2012, it was estimated that one in seven (13.9%) Labradors are carriers of one copy of the disease mutation. The current name of the disease, centronuclear myopathy, refers to the characteristic centralized location of the nucleus (the intercellular structure that houses the DNA that contains the genes) within muscle cells of affected dogs as seen on microscopic examination of muscle biopsies. In addition to centralized nuclei, examination of muscle biopsies also shows replacement of normal muscle fibers with non-contracting fibrous tissue. The ratio between types of muscle fibers is also disrupted with Type I muscle fibers (slowly contracting fibers used for prolonged exercise such as long distance running) being abnormally increased and Type II muscle fibers (fast contracting fibers used for strong muscle contractions and short bursts of power) being greatly decreased. This imbalance of muscle fiber types prevents dogs from normal muscle contractions needed for high intensity exercise and hunting. Lastly, as affected dogs age, their muscles becomes more infiltrated with fat than normal dogs. Genetic testing can accurately identify carriers of this disease. Knowledge of the genetic CNM status of a dam and sire will allow for proper mate selection to avoid CNM in puppies. Carrier dogs should be bred with dogs free of the mutation to prevent affected puppies from being produced. In affected dogs, genetic testing can help differentiate this disease from exercise-induced collapse (EIC), another inherited disease of the Labrador that can present with similar clinical signs of collapse with exercise despite being due to a different genetic mutation. Paw Print Genetics currently offers testing for both CNM and EIC in Labradors. Kramer JW, Hegreberg GA, Bryan GM, Meyers K and Ott RL. A muscle disorder of Labrador retrievers characterized by deficiency of type II muscle fibers. J. Am. Vet. Med. Assoc. 1976 Oct 15;169(8):817–820. Maurer M, Mary J, Guillaud L, Fender M, Pele M, Bilzer T, Olby N, Penderis J, Shelton GD, Panthier JJ, Thibaud JL, Barthelemy I, Aubin-Houzelstein G, Blot S, Hitte C, Tiret L. PLoS One. 2012;7(10):e46408.